Last week I ran an online workshop on designing for blended learning and there was some interest in how we use Facebook groups for discussion forums. I offered to share the content we use to introduce students to how we use Facebook, as well as some info on my approach to using it. Here it is! We’ve been using Facebook groups as discussion spaces for a few years now. I initially made the move for a couple of reasons. Firstly, I’d had a really positive experience using WordPress Multisite with BuddyPress for one of my unit sites. I found conversation flowed better in this environment than it does on Blackboard discussion forums. Activity feeds on BuddyPress sites basically replicate Facebook walls (although they do it imperfectly). Seeing I’d had success with BuddyPress, I thought I’d give Facebook a try. Secondly, I also found monitoring Blackboard discussion forums really annoying because I can’t respond on my phone and to keep on top of activity in the forums, I have to subscribe by email, which just means more email… And I really don’t need more email. Alerts for Facebook group posts pop up everywhere – on my phone, iPad and laptop – and I can respond instantly. After one semester of using Facebook for a couple of my units, students started asking for Facebook in other units too (oops. This is why decisions about tool changes should be team decisions. Kinda backed everyone into a corner on this one!). I also quickly realised the level of discussion that occurred in a Facebook group far exceeded the level of discussion I’d ever experienced in Blackboard discussion forums. Invariably, every semester we have a couple of students who are a bit hesitant about using Facebook for study, so I wrote up some basic guidelines for participating in Facebook groups. We recently had a web content editor working with us for about five months and she did a lot of work on our Blackboard site content and word-smithed the guidelines so they were a bit less Kate-ish (i.e. not quite so informal and chatty) and better structured. Here is the content we use on our Blackboard sites to introduce students to using Facebook as a communication tool. Feel free to use it if it’s helpful. You’ll be able to start participating in the group after the teaching staff approve your request to join. That usually takes [X amount of time]. We use Facebook groups instead of discussion forums on Blackboard because they seem to promote more open discussion. Facebook groups can be easily accessed on mobile devices, which means it’s easy for you to post and respond anytime, anywhere. For many students, Facebook is a more intuitive tool than a discussion forum. It’s also a space many students are constantly immersed in. We know that some people view Facebook as their own personal space and may not be comfortable with using Facebook for study. But we also know, based on past experience, how much students benefit from having a Facebook group for the unit. So we’d like to ask you to give it a go and see what you think. To help you with managing any apprehensiveness about using Facebook for study, we have developed some ground rules. To make everyone more comfortable, we have some ground rules for using Facebook groups for units. Treat the Facebook group like you would a Blackboard forum. Ask each other questions, share resources, look for assignment partners, and have conversations. Treat each other with the respect you would normally extend to each other in a face-to-face classroom. An informal tone is fine, as long as it’s respectful. Don’t send friend request to everyone in the class (including the teaching staff) – unless you are actually friends! While approaches vary, most teaching staff will not accept friend requests from students. If you get a friend request from someone in the class and you don’t want to accept it, that’s fine! Don’t feel pressured to accept any friend requests. Facebook is a bit like your lounge room. It’s a private-ish space where you interact informally with people you know. We’re in this group space to learn, not to become BFFs. Post on the group wall as much as you like, but if you need to send a private message to the Unit Coordinator, send an email rather than a private message on Facebook. Worried about your privacy on Facebook? Rest assured: if you are not ‘friends’ with any of your classmates on Facebook, they cannot see your personal profile. Or rather, they can only see as much of it as your privacy settings allow. Lifehacker maintain a useful, always up-to-date post about managing your Facebook privacy settings [opens in new window]. There are a few things I do to make Facebook groups work as dynamic discussion spaces. Here are my tips. Get students to introduce themselves with an icebreaker at the beginning of semester. Prompt them to do something fun with their intro – like share one thing nobody else in the class knows about them. This is a good way to get people talking about hobbies, holidays, the talent show they won when they were 12… Then everyone connects as people, not just as classmates. It also gives you some insights you can use later to engage students. I ask students to post all questions about content and assessment on Facebook, rather than emailing me, and I’m a stickler about this. Unless it’s a personal question, I don’t answer anything about the unit or assessment via email. This has a huge impact on the amount of email I get from students. But I’ve also recently realised it makes me kind of dread my Facebook notifications almost as much as I dread looking at my inbox. This is definitely a new thing, and probably only an issue this semester because of my circumstances (I’m busier than usual and the notifications can sometimes feel overwhelming). And at the end of the day, a Facebook notification is still easier to deal with than an email. I ask students to respond to each others’ questions on Facebook and to give each other feedback on draft work they post there. We talk a lot about learning communities and the importance of everyone getting involved. Very often, by the time I see a question on Facebook from a student, another student has already answered it. I tell students they can only expect me to respond during business hours, and if I respond out of hours, it’s a bonus rather than the norm. I’ll be online 4pm til 5pm on Saturday to respond to questions they’ve asked during the day. Setting a defined time means they can plan to be online so if I need to clarify something related to their question, they will be able to respond. Some of my colleagues just specify they won’t respond on the weekend, and that works too. Since we have both online and on campus students, I design each activity I run in classes so that it will work either in Collaborate or as an activity students can complete independently. Where the activity needs to be completed independently, I ask students to post the product of the activity on Facebook and I give them feedback on it there. They aren’t mandatory, but they are often designed to provide scaffolding for assessment so at least some of the students complete them. When I provide feedback on draft assignment work (which I generally try not to do, but sometimes it’s unavoidable – e.g. if on campus students are getting feedback in class, I need to provide a similar opportunity for online students), I ask students to post their work to Facebook and I give feedback there. After I provide individual feedback, I write up general comments and post those too. This way everyone benefits and everyone has access to all feedback related to the assignments. Facebook is for discussion, not for storing content. Any clarification or feedback I provide about assessment, or resources that relate to classes, also get posted on Blackboard so that it’s the central content repository. 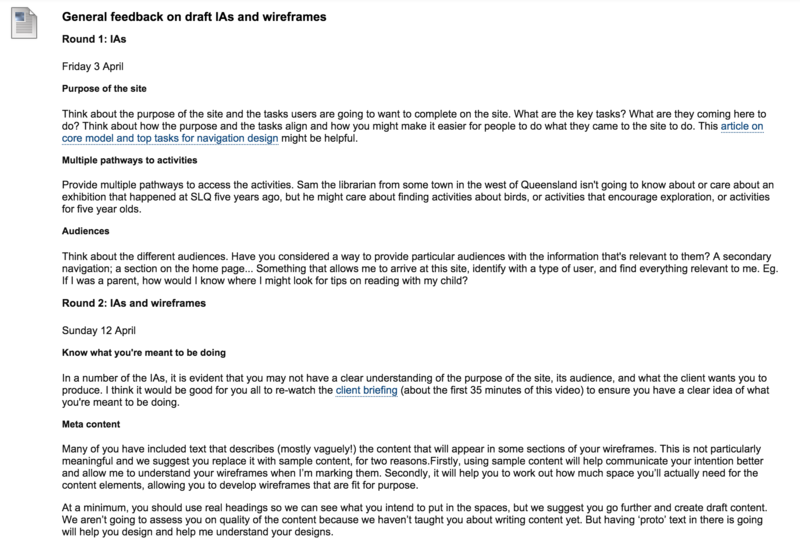 For example, here’s a screenshot of a summary of feedback I provided on draft assessment work (in this instance, I gave students two dates by which they could post parts of the assignment for feedback). This way, any students who don’t want to use Facebook still get the information about the assessment. I’ve personally never had a student who refused to use Facebook. Sometimes students may not join the group right away, but they do after a time. Although students miss out on the conversation if they’re not on Facebook, they still get all the content on Blackboard. Even students who are reluctant to use Facebook initially realise the benefits after using it. I try to plan ahead and schedule posts for my Facebook groups well in advance. I usually have to make additional posts, but any reminders about assessment items, classes or activities can be scheduled at the beginning of semester or at least a few weeks ahead. I use Buffer to schedule posts and it just means I’ve got one less thing to think about. Do you use Facebook groups in your teaching? How do you use them? Do you have any useful tips?